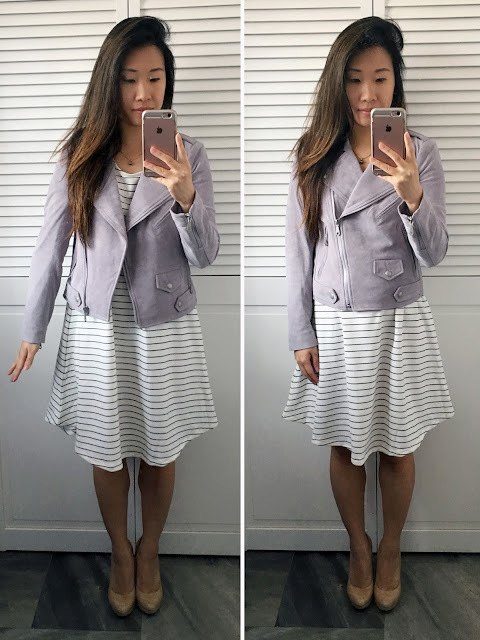 I was shamelessly browsing online the other day and came across the Rebecca Minkoff 'Wes' Crop Suede Moto Jacket that I was immediately drawn to because of the cropped length on the model photo, which is always a plus when shopping for petites. I decided to go for the splurge since I still had several Saks gift cards from my wedding, and was filled with mixed emotions of hoping it will fit to hoping it won't fit to save on money. When it finally came, I couldn't get over how super soft it is! Jacket: Rebecca Minkoff 'Wes' Crop Suede Moto Jacket. Dress: White Sleeveless Tent Dress. Shoes: BCBGeneration Tinas . 1. Heat the oven to 350 degrees. Generously coat the wells of a 12-cup muffin pan with oil or butter. 2. In a medium-size bowl, stir together the flour, baking powder, and salt. In another small bowl or glass measuring cup, stir together the milk and vanilla. 3. In a large bowl, use a mixer set on medium speed to beat together the butter and sugar until smooth, scraping the sides as needed, about 2 minutes. Increase the mixer's speed to high and add the eggs, one at a time, beating well between each addition until a thick, creamy batter has formed, about 3 minutes. 4. Add one third of the flour mixture to the egg mixture and beat at low speed until the flour has disappeared. Pour in half the milk mixture and continue beating until well blended. Repeat the process, alternating between the milk and flour mixtures and beating between each addition until evenly blended. 5. Divide the batter among the muffin pan. Transfer the pan to he oven and bake until the cupcakes have begun to pull away from the sides of the pan, about 15 to 20 minutes. Transfer the pan to a wire rack and let the cupcakes cool for 10 to 15 minutes. Gently loosen the cupcakes from the pan and transfer them to a platter to cool completely.